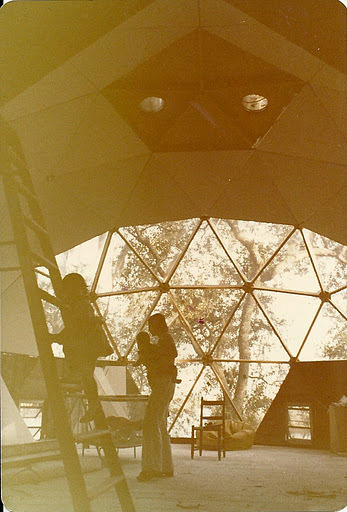 What Growing Up in A Geodesic Dome Taught Me About Occupy | PROOF OF GOD! ...and other tragedies. It’s a simple idea really. Points of cohesive concentration, with rays connecting to other points. A sphere made of hexagons made of triangles, with no edge or beginning or end. Buckminster Fuller popularized the notion of a geodesic sphere. He worked on the structure, for which he earned the U.S. patents, at Black Mountain College, right down the road from here. I always just assumed that my father invented the dome. so that we could live in it. It wasn’t an ordinary room. It was a dome. It wasn’t an ordinary dome, either. It is on stilts, and part of it is composed of plexiglass framed in wood, a wall of windows at mid-oak level, over the marsh and the river…the ocean somewhere near where you couldn’t see any further. Funny, that I was using the term “wasn’t” to speak about something that still very much is. The house in S. Ga. is still there. My parents rent it out to college kids who grew up in the area. The have the best living room ever. They have The Dome. 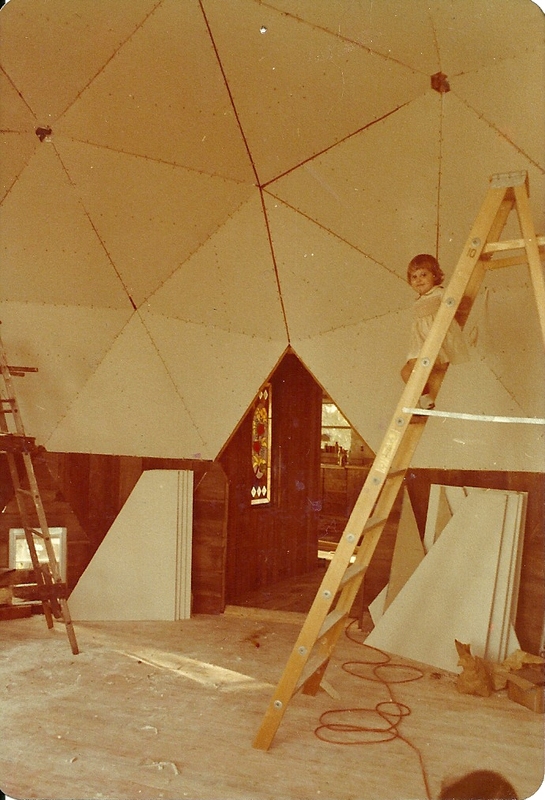 I don’t know why I haven’t asked my father why he was so driven to build a geodesic dome for a living room. He is really a very reasonable man, but then again, maybe not so much? I mean, really…he built a dome, on stilts, made partially out of glass, with ventilators, and he did all this largely by himself. Clearly, the man has a bit of unreasonable in him. I just now, right this very instant, remembered the ventilators. Odd little knobby protrusions on the domes exterior, spirals spinningspinningspinning when the wind blew. So, yes, apparently I gleaned all I need to know about the geometry of revolution from simply sitting in the living room and looking around. So, in an ideal world, Occupy would be structured as Fuller’s geodesic sphere. Evenly spaced, with clear lines. However, we know that ideal worlds never work out well and so, if it were that Occupy was nice and tidy, well, it would be impossible to get this job done with all the space in between those centers, just a few thin lines connecting them. …the space in between the lines is to be considered negative, empty, plexiglass. When I began to sketch out what seemed to me to be happening with Occupy, I began to think about the Dome. I thought a little about how the various Occupy sites are set up and how they hold cohesion. I thought about what was happening in the spaces between Occupy sites. Then I tried to draw a nice even geodesic curve. 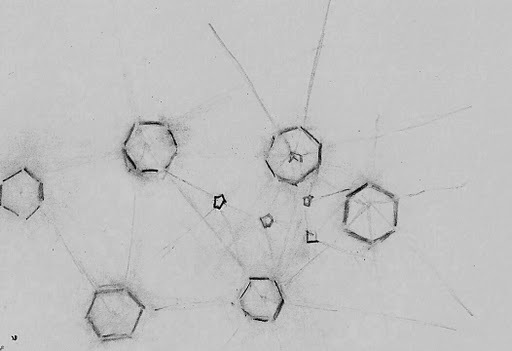 Immediately, the page began to fill with errant hexagons, wispy lines that led to nowhere. Yes, there were centers, and their were lines…but, the centers were too scattered and the lines were too fine. There were other points, as well. Of course, it has to be a mess. To think of Occupy in terms of geodesics or spirals is an error. The spiral construct is erroneous for the obvious reason that spirals start somewhere. Yes, one could say that the first physical Occupation occurred in New York City, on Wall Street. However, is that where Occupy began? Even if we could all agree that NYC was the beginning, if the movement were following a spiral, wouldn’t the growth of the movement be measured by the angles set forth by Fibonacci, rather than scattered all about in every possible way? I almost started talking about spiral this and spiral that and isn’t it a crying shame that the shape of our known universe is thought now to be some flimsy New Age nonsense. There are layers and layers of this movement, an incredible amount of energy and interaction. It is snakeskin over honeycomb over turtle’s back. There are wasp’s nests as well. Yes, it is a mess. It is also terribly fascinating…beautiful, too. *Humans can’t really claim much in geometry. Squares, maybe? Perfect cubes don’t typically exist in nature. Well, as in all things these days, apparently there is some tom-foolery happening here. My visit counter isn’t showing and the youtube video bar is supposed to show links to awful videos of me playing banjo and vague esoterica involving clouds. If you don’t see these things, that doesn’t mean that they’re not there…it just means that things aren’t always as they are presented in the digital age. If I sound a wee bit paranoid, that just means that you don’t know how long I have been doing this and just how far it all has come and gone. …back-ups and archives, my friends. I’ve got them both in spades. Finding ways to participate in a way that resonates and fits with one’s life can be hard. There are some very sharp lines drawn in the formalities of the movement. There are many different ways to be an activist and I wonder sometimes if the modes of action/expression associated with Occupy don’t overshadow the many other viable forms of encouraging change. What does that mean? Well, there is quiet activism and loud activism, group activism and individual activism. Both have their intrinsic values and both are vital to change. Loud group activism gets attention, but it doesn’t always get things done and can actually complicate a group’s message and present barriers to fruition of intent. Quiet individual activism – writing letters and talking to people about change on a personal level, working hard in jobs that actively support change – doesn’t always get the recognition it deserves as a valid way of participating. It can be very difficult to participate in any movement and the strains of working with people to organize a large action can really dampen our energies and confuse us about the worth of our participation. The American Spring will happen, in some form or fashion, but it may not look like what we had hoped it would look like – with large worker uprisings and massive systemic disruptions, rolling blackouts, and broad reclamation of public commons. If Occupy has proved anything, it has proved that the Systems of profit and power are far more entrenched in the American mind and freewill than we even imagined possible. However, I am hopeful (always!) that the massive body of media and clarified ideas that was generated in Phase 1 will begin to seep into the insular circles of American life and awaken the masses in some measurable way. I think that will happen and is already happening. That’s the thing with ideas, good ideas spread and grow, become worked into the collective consciousness. Wouldn’t it be great if the Postal Workers rose up against the Gov’t for closing down facilities and for forcing them to work in those drab communist-style offices in ways that used to make them go insane and violent? Wouldn’t it be great if inner-city and poor-rural communities got together and structured new economies, took over their own policing, began demanding en masse that jobs and dignity be created by them and for them? Well, they shut you up and move along. What systems have done to American youth and American families is enough to enrage any thinking human being, which is why the systems are trying so very hard to keep us from thinking. The Cultures of Economy are very strong and people have been warped by them for a very long time. Gil Scott Herron was right: The revolution will not be televised. Pretty soon, all those clever journalistic ideas are going to start waking up…ideas slip in. The System has gotten itself into a mighty double bind. In order for it to continue, it must cover up all its evils and the fact that it is, in a very real way, so very much like what we have been taught to be wary of, to not trust.The messages we’ve been given…about pride and responsibility and the best stuff of patriotism…they are very strong. Pretty soon people are going to start realizing that it is not about the flag or the government, it is not about WalMart and the 4th of July…it is about US…the 99%. Well, hopefully people will want to TAKE IT BACK. The nonviolent ethos that Occupy supports is a powerful one, but it is hard to take hold in the minds of the conflict-oriented. Systems teach us conflict-orientation and teach us that conflicts are resolved with outright violence. That is what we have gotten from the trickle down economy. We were taught to fight. We even fight with ourselves. I doubt anyone will read this, and that’s a shame. This page sometimes feels like a null state to me…some activity, not too much interaction. Some of us have come to believe that our ideas do not not matter here, but that is okay…we just take them other places. Many of the outliers in Occupy movements have other circles they travel in and they carry ideas back and forth. Thus, things grow. It may not be called Occupy, but it is growing. Thanks for giving me the opportunity to get this out of my own little system. Much Appreciation and, always, in Solidarity with the Good Ol’ 99%! Onward and Upwards and Outwards. All Ways. Posted in this is not terrorism.